If you have kids, you end up with some interesting combinations of smells in your laundry room. There are times, like during soccer season, when a little extra kick of scent would be welcome. Gain's Firework In-Wash Scent Booster offers to kick up the scent of your laundry with small crystals that release scent directly during the wash cycle. Using this product is fairly simple. The cap for the Gain Fireworks serves as a measuring tool. Choose how much of a capful you want to use. Measure the little crystals into the cap before dumping them directly into the drum of the washing machine where the clothes are also placed. Do not put these crystals in the soap or fabric softener dispenser. When added properly in the drum of the washing machine, the crystals dissolve, leaving behind a fresh scent for. The scent is a typically Gain, fresh laundry scent that wasn't overwhelming but recalled the soft, fresh smell of clean laundry. At home, the first test for the product was a load of bed linens. we were a little worried that pink color would find it's way onto the white linens, but that didn't happen. Instead, we pulled pristine, clean blankets and sheets out of the dryer. My daughter commented on their wonderful smell and went straight to make her bed. Over the next couple of weeks, the Gain Fireworks was tried on all different laundry types. The smell definitely stayed with the clothes for at least 1 to 2 weeks after washing. 1/3-1/2 of a capful was added to most loads. Adding more would increase the scent. Gain Fireworks comes in a 14.1 oz container and it is available in four scents. One bottle lasted at least 18 to 20 loads, but that depends on how much you use. 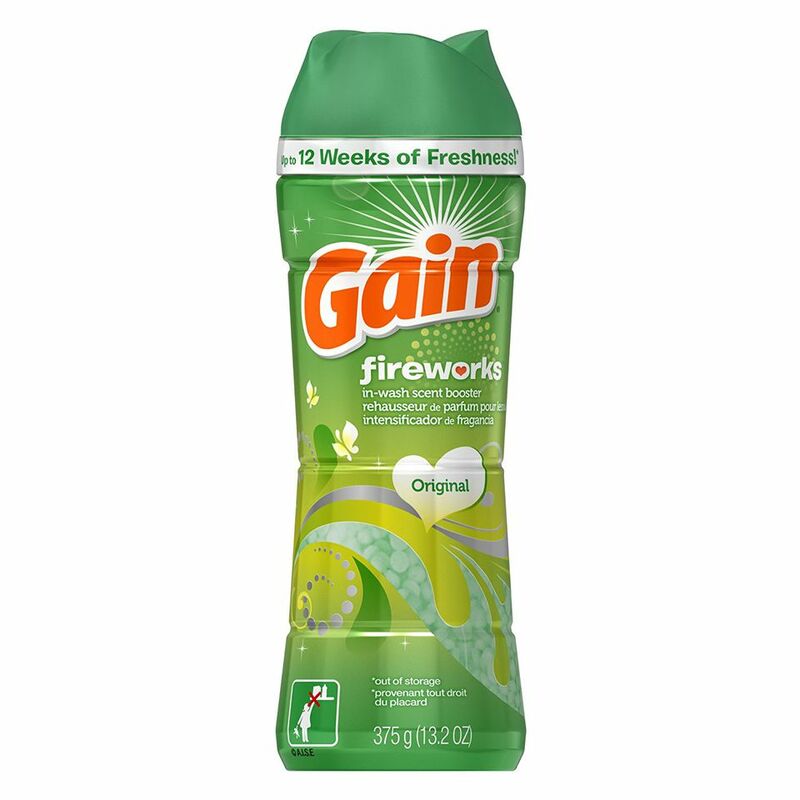 We really liked using the Gain Fireworks In-Wash Scent Booster. It's a simple product which delivers on its promise and it's easy to use. The scent lasts longer than just out of the dryer and the smell is fresh and comforting without being overwhelming. Some reviews complained that the crystals didn't dissolve or left residue on clothing. After washing over 20 loads with this product, we didn't experience that even once. There are a lot of claims that the scent can last for a couple of weeks in your closets, but for us, the scent lasted at most a week. Gain ended up having my favorite scent, although each of my kids had their own favorite among the competitors. The problem with these types of products is pretty much the same with Gain's version as it was with the Purex Crystals and Downy Unstoppables: all are scent products only -- none acts as a fabric softener, a dryer sheet, a stain remover, or a detergent. They cost as much or more than many other laundry additives but only provide scent. For me, adding this to my laundry routine doesn't make financial sense. If you are big on scent, though, this product might be for you. Should You Use Clorox Disinfecting Wipes? Should You Use a Febreze Plug Air Freshener? Is the Eureka EnviroSteamer Worth the Price? Does the H2O Steam Mop Get the Job Done?